It’s the very last day of VeganMoFo today and it’ll also be my 20th MoFo post. I’ve been out a few times this week and eaten a few old favourites which I’ve already blogged about, so nothing of interest there. 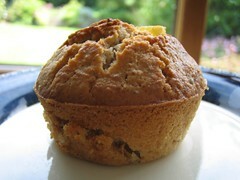 So out of desperation for something to write about – I made muffins! These are tester muffins for Isa’s brunch book and I’d made them before as testers and really liked them. I very rarely bake – it’s too precise for me and goes against my usual “pinch of this, pinch of that” attitude! I also don’t really like sweet food much and I’d always far rather fill up on main courses than eat muffins in between meals. But I’ll get an occasional urge for something nice to eat with a cup of tea and today was that day. The really nice thing about this recipe is that it uses dried mango so you can have a lovely sunshine muffin flavour even on the last day of October when it’s dark and cold. I’ve really enjoyed doing MoFo this year but the hardest part about it has been keeping up with all the wonderful posts on all the other blogs out there. There are so many creative, intelligent vegan bloggers out there and my google reader has been bulging at the seams with brilliant ideas, gorgeous photographs and delicious looking recipes. So even though I’ll be back to my usual rate of blogging from now, I’ll be busy catching up with all the great recipes I’ve missed!! This entry was posted in Crack of Noon, veganmofo and tagged veganmofo by efcliz. Bookmark the permalink. ooh! i made a muffin like that once, but it also had cashews. yours looks like a million times prettier than mine did though! What a perfect looking Muffin! I still have loads of catching up to do as well – but it’s been great discovering your blog!